Peter Parker he is no longer; now, Spiderman flies through the streets at night, protecting the innocents who find themselves in peril. Click here to play! Join the arachnid boy in his quest for justice in a city where anyone is capable of evil. 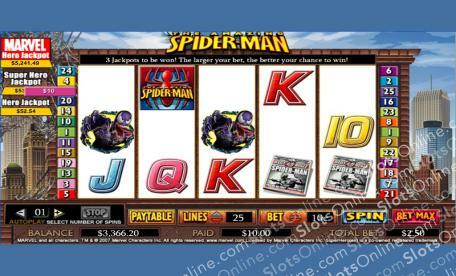 Spiderman is an exciting 5-reel slot played across 25 lines of pure Spidey entertainment. The Substitute is Spiderman himself and he can become any other symbol on the reels except Scatters. Additionally, if you manage to spin up Spidey on reels 2 and 4, you will trigger the lucractive Spiderweb Feature. The Spiderman logo is Scattered and if three or more are spun up at once you can choose between Free Games or a Bonus Game! The Bonus Game will place you in the role of Spidey and you must defeat Venom to save Mary-Jane. Join the masked crusader today for all the excitement and adventure that Spiderman can bring, in the comfort of your home! The Spiderman Logo is scattered and if three or more are spun up after one attempt the Bonus Game and Free Game features are available. 15 Free Spins are on offer, or the exciting Bonus Game. Spiderman is the Substitute and can become any other symbol in the game besides Scatters. If he shows up on reels 2 and 4, the Spiderweb feature will activate. The Bonus Game is triggered when three or more Scatters appear. Once inside, you take on the role of Spiderman and must save Mary-Jane from the evil Venom.